Sleep is when your body does its maintenance work. Toxins are swept from your brain. Tissues rebuild. Memories are consolidated. Energy is restored. It should be no surprise, then, that lack of sleep can interfere with your health. This maintenance work can’t be done while you’re up and active. If it doesn’t all happen during sleep, it doesn’t happen at all. And the effects can be profound. Each percentage reduction in the time people spent in REM sleep was associated with a 9% increase in the risk of dementia. There are lots of things that can keep you from getting a good night’s sleep: the neighbor’s noisy dog; stress; chronic insomnia. 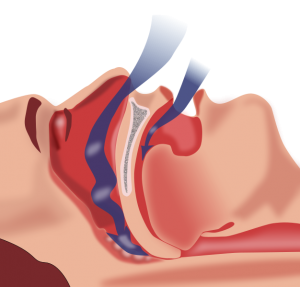 One of the most common, though, is obstructive sleep apnea (OSA). Having sleep apnea means you periodically stop breathing during sleep. It happens when the airway becomes blocked by the tongue or soft tissues relaxing and falling backward. When air is forced past the blockage, the result is a snore – which is at least a sign that a person is getting some air. It’s hard to overstate the importance of oxygen. While you can live days without water and weeks without food, you can only last a couple minutes without oxygen before brain cells start to die. The lack of oxygen that triggers apneic events is thus a real emergency. The body goes into red alert and does all it can to get the oxygen it needs to go on living. You’re startled awake, often with choking or gasping. And this happens again and again throughout the night. And you don’t get the sleep you need. This impacts far more than just the brain. According to new research in the Journal of Clinical Endocrinology & Metabolism, untreated sleep apnea can raise blood sugar and fat levels, blood pressure, and stress hormones. [Senior author Jonathan] Jun and colleagues found that CPAP withdrawal caused recurrence of OSA associated with sleep disruption, elevated heart rate and reduced blood oxygen. CPAP withdrawal also increased levels of free fatty acids, glucose, cortisol and blood pressure during sleep. The more severe the OSA, the more these parameters increased. In addition, glucose increased the most in patients with diabetes. Increases in fatty acids, glucose and cortisol have all been linked to diabetes. The Johns Hopkins team also found that blood pressure increased and the arteries showed signs of stiffness in the morning without CPAP. Over time, increased blood pressure and vascular stiffness can contribute to cardiovascular disease. Indeed, there’s a substantial body of evidence linking sleep apnea to a wide range of systemic health problems , including diabetes, heart disease, stroke, high blood pressure, cognitive issues, and even possibly some cancers. Some, such as Dr. Felix Liao in his book Six-Foot Tiger, Three-Foot Cage, have suggested that a blocked airway and sleep apnea may contribute to many dental problems, as well. Fortunately, CPAP isn’t the only option for dealing with apnea. 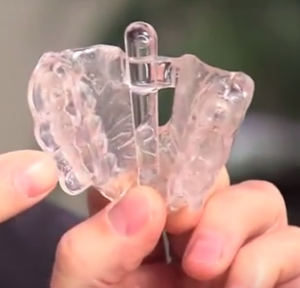 More and more evidence shows that oral appliance therapy can be just as effective and much more tolerable. (Who wants to sleep with a CPAP mask covering their face, really?) Many of these devices work by gently holding the lower jaw in a more forward position, keeping the tongue from falling into the airway. Others, such as the Full Breath appliance we provide in our office, work by gently depressing the tongue, keeping it out of the airway. Yet another option is NightLase – a laser treatment that actually widens the airway by renaturing and restructuring collagen. Research shows that NightLase can help reduce snoring 74%, and is an effective, non-invasive treatment for mild to moderate obstructive sleep apnea. Yes, there are dental solutions to sleep apnea.